Saving Millions by Maintaining Insulation Systems: Control Your CUI Monster! That question reflects the frustration—often misdirected—the Netherlands Centre for Technical Insulation (NCTI) encounters over and over when confronted with corrosion under insulation (CUI) problems. 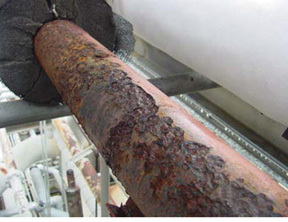 It is time to counter the idea that insulation is the cause of corrosion. In today’s reality of strict budgeting of time and money, an integrated approach is not the easiest solution, but it is increasingly necessary to fight CUI—often the number one cost factor in a maintenance budget. CUI has been on the agenda for a long time, but the recommended solutions are in daring contrast with the enormous costs for our companies and society. In the United States, an estimated $300 billion per year is now seen as a conservative estimate. The true figure, according to NACE International (formerly the National Association of Corrosion Engineers), might be closer to $500 billion per year! To get a better grip on CUI, it is important to realize that insulation plays a pivotal role and should receive the utmost attention in all phases of a project, from design through operation. 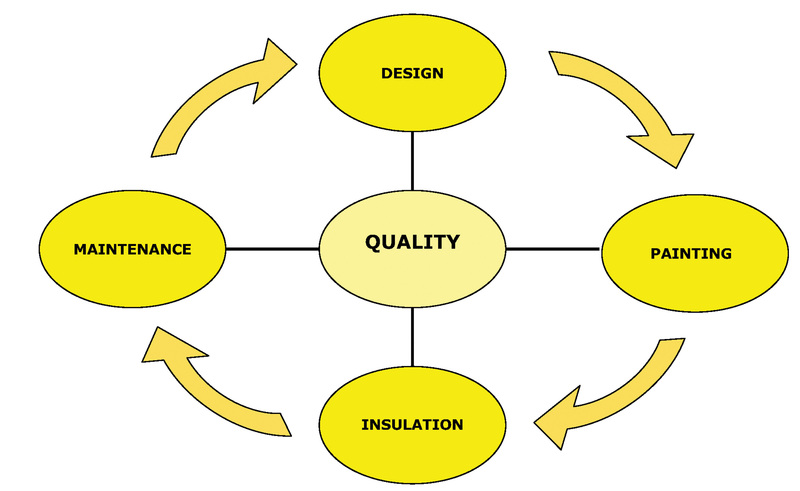 NCTI, from the insulation perspective, recognizes four phases in the chain of responsibility for quality insulation installation: (1) design, (2) painting and coating (conservation), (3) insulation system, and (4) maintenance and inspection (see Figure 1). All four are important in mitigating CUI and ensuring the best thermal performance. As the expression goes, the chain is only as strong as its weakest link. It is essential that the specification for thermal insulation of the plant and equipment be addressed early in the design stage. It is important that the insulation contractor be able to submit a system that can be incorporated by the plant designer. Too often installations are designed that, with respect to quality, can hardly be insulated—let alone in an optimal way. A design that works well in CAD/CAM drawings but does not incorporate insulation requirements will most certainly give the owner problems down the road. At the design stage, allowance should be made for sufficient clearance around pipes, equipment, and/or elements of construction. Consideration should also be given to the additional weight of the finished insulation system. Unfortunately, very often this is not the case. Solutions are provided later, but these can rarely be classified as optimal and in due time will cause problems (e.g., in thermal performance or weatherproofing). It would serve all projects well if everyone focused on the fact that CUI starts on the drawing table. Before insulation is installed, an appropriate painting or coating system should be an integral part of the preparation phase. Often either the awareness or preparedness (i.e., budget) for proper piping and equipment conservation is lacking. Substandard execution and surface preparation—or leaving the painting system out completely—are responsible for more than 80 percent of the installation failures due to CUI, yet this is common practice. It is essential that a proper conservation system be applied in the temperature range from 50°C to 150°C. When process temperatures are cyclic, the high-risk range for CUI extends to -20°C to +320°C. Paint systems, organic and inorganic, are used as a “last line of defense” to prevent CUI. The failure probability of a coating system increases with age and depends on the operating conditions. Most painting systems fail after 10 years, after which the bare steel can be attacked by CUI. Detailed description of coating and painting systems usually falls beyond the scope of an insulation specification, but the utmost attention should be paid to this subject. A well-designed painting or coating system, together with a proper insulation system, will offer the benefits of improved control of CUI, reduced maintenance cost, installation lifetime extension, and longer undisturbed production. The system will pay for itself in enhanced energy performance. It is also important to stress the need for a proper insulation standard. The commission on industrial insulation standards in the Netherlands, CINI, publishes the “insulation for industries” standard, which is specified worldwide in main industrial insulation projects. In this standard, material and application specifications are worked out, with hundreds of CAD/CAM detailed sketches and conservation and measurement standards. The base of the standard is control of CUI and best thermal performance of insulation systems. Experts from the industry and contractor communities worked together on the standard, which is updated annually using the best available techniques. The quality of insulation systems has improved. But reality is unruly, standards very quiet, and budgets destructive. Despite good planning and specs, when the period of preparation startup draws near and insulation needs to be applied extremely quickly, standards and quality diminish in importance. Unfortunately, despite loud cries from corrosion engineers and the facility owner community, maintenance-free insulation systems do not exist. Insulation systems, no matter how well designed and well installed, eventually lose the ability to shed water. 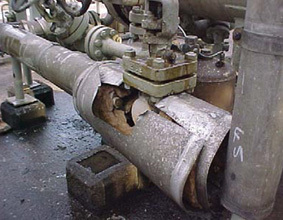 This deterioration occurs for many reasons, including mechanical damage in the operational phase, and can be caused by the inevitable maintenance of an operating plant. Routine maintenance on insulation is usually a low-priority task because many operating departments cannot easily detect or assess the immediate effect of insulation damage. Maintenance is focused on equipment that has a direct and easily perceived impact on operating reliability—this in spite of experience showing that CUI has a major effect on maintenance budgets. NCTI statistics show that 55 percent of insulation system failures occur in the user or maintenance phase. Insulation must become an integral part of maintenance programs. After an inspection survey has been completed, the reported damage and remarks should be translated into a plan of action for remedial and preventive maintenance. Companies that apply risk-based inspection work processes to determine the priority and inspection scope should make coating and insulation systems an integral part of their assessment. For both coating and insulation systems, it is recommended that a yearly visual inspection be performed (to provide a first impression of system status). If defects are detected, more detailed inspections and maintenance should be executed (upon priority). For cold insulation systems, a regular inspection for damage of the vapor barrier is necessary to prevent progression of any damage. Recommendations for preventive maintenance refer to situations or structures that need to be modified to prevent future or repeated damage to insulation or underlying surfaces. To systematically control the upgrade of insulation in a plant, the various units should be divided into manageable areas indicated on a plot plan and the work carried out area by area. Simultaneously, maintenance painting should be scheduled in the given areas. The correct application of coatings—along with the proper design, specification, installation, and, most importantly, maintenance and inspection program—will allow for better control of CUI, lower maintenance costs, improved thermal performance, and extended life of process equipment. The result is longer, undisturbed, and cheaper production. It is not a game of chance. Proper design, conservation, insulation, and maintenance will give facility owners the best chance to control CUI and have all their efforts quickly repaid in energy savings and reduction in CO2 emission. NCTI life cycle chain for ensuring quality in installation of insulation. The results of the killer CUI. Ready for maintenance or fit for purpose?